The pyramid at Coba is the highest in the Yucatan at 42 metres. Back half is still covered with jungle. 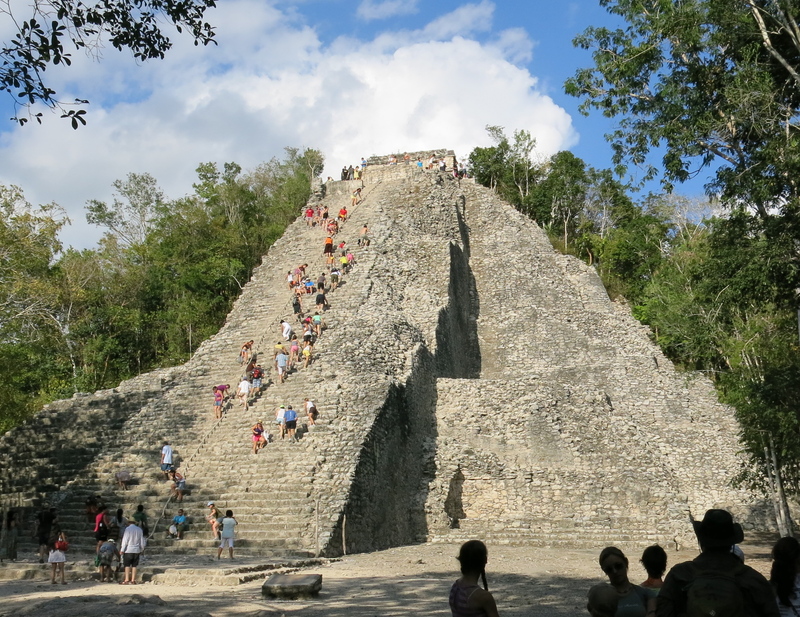 It is four days after Christmas and tourists clamber up the steep steps of Nohoch Mul pyramid in Coba sweating under a hot sun as they soak up the beauty and wonder of what the Mayan civilization has bequeathed us. They are among the many thousands who have ignored dire predictions about the end of the world as the Mayan calendar drew to a close on Dec. 21 and flooded into the Yucatan Peninsula. They have come to experience what is fabulous about Mexico – the sun, the beaches, snorkeling in the warm Caribbean Sea, semi-tart margaritas perfumed with lime and the spicy cuisine made earthy with the abundant addition of cilantro. They also come to see the magical and enigmatic ruins such as Coba, about 40 kilometres northwest of Tulum, which is on the Mayan Riviera in the state of Quintana Roo. It is one of the lesser known of the Mayan ruins and much of the site is still covered in jungle including the back half of the Nohoch Mul pyramid. But at 42 metres high, the pyramid towers over its more famous brethren, Kukulkan or El Castillo (24 metres) at Chichen Itza and the Pyramid of the Magician (35 metres) at Uxmal. The Coba pyramid is said to be the tallest in the Yucatan. When Coba was a functioning centre more than 1,000 years ago, it is estimated that 50,000 people lived here in an area of 80 square kilometres. Only a fraction of the structures that existed then have been cleared of the dense jungle cover, but they evoke much interest in the many visitors who take advantage of rental bikes to move around the vast site. There are also many standing slabs of rock called stele, which have carved hieroglyphs. Round columns supported buildings at San Gervasio which drew pilgrims from mainland. What they all mean is difficult to ascertain. Scholars have spent many decades – since the 1920s when they began unearthing the sites – trying to decipher the social structures and history of the Mayans. There are many books extolling their incredible feats of engineering and building, but they are also full of suppositions and questions about this socially stratified civilization and the people whose descendents make up much of the population today. After more than two hours of walking along the shady paths viewing the structures including the ball court, my wife and I hire a tricycle driven by Ernesto to take us to the pyramid. We climb to the top and look out a great distance across the landscape, which features many low hills – possibly more ruins waiting to be uncovered. As we roll along in the tricycle after descending (very carefully), we also see the remains of a major road called a sacbe (white road). Raised a couple of feet above the jungle floor and about 20 feet wide, it stretched 100 kilometres from Coba to Yaxuna near Chichen Itza. The Mayans built many roads, although they did not use the wheel for transportation. One of them was used by pilgrims moving from Merida to the Caribbean coast where they boarded boats for the island of Cozumel and the site of San Gervasio dedicated to Ix Chel, goddess of the moon and fertility. While much smaller than Coba, this site is also spread out and it takes a couple of hours of walking the new paths – and those built by the Mayans – to see most of the structures. One of them is called Las Manitas (little hands) and it has columns and red-colored hand marks on inner walls. 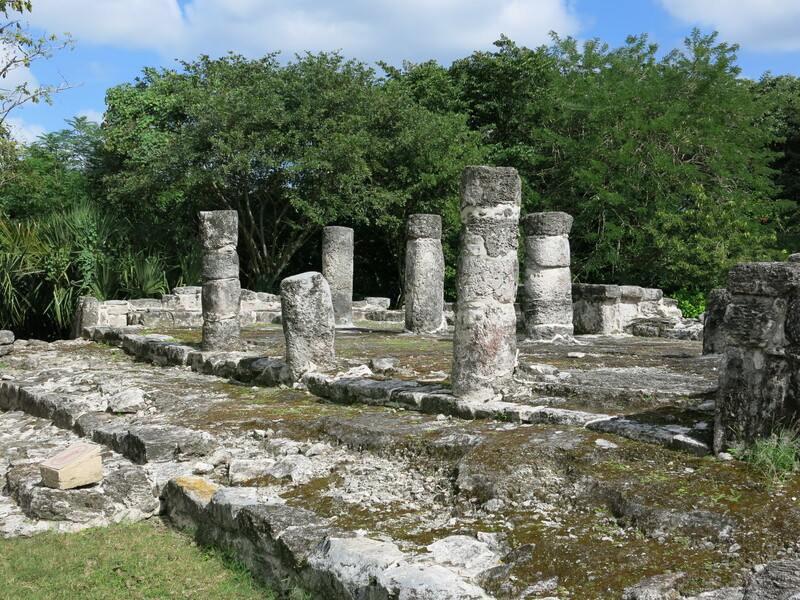 Another structure called Las Columnas (the columns) has seven pillars and the earliest part of the building containing several tombs dates back 1,000 years. We speak briefly with a woman from Toronto who has landed on the island from a cruise ship, which has docked at San Miguel, a popular port for people touring the Caribbean by boat. The town has berths for six cruise ships. The island is small and you can drive around it in a few hours with stops at the ruins and beaches along the east side of the island. After leaving San Gervasio, we head east in our rental car for a few minutes to the beaches and stop at a restaurant, the Punta Morena, which has plenty of palapas (umbrellas providing shade), a pool and a beach that goes on forever on one side with a rocky shore on the other side. We tackle a lunch consisting of a plate of guacamole, an order of three chicken tacos and soft drinks, which sets us back $24. The view of the crashing surf and the beach is priceless. 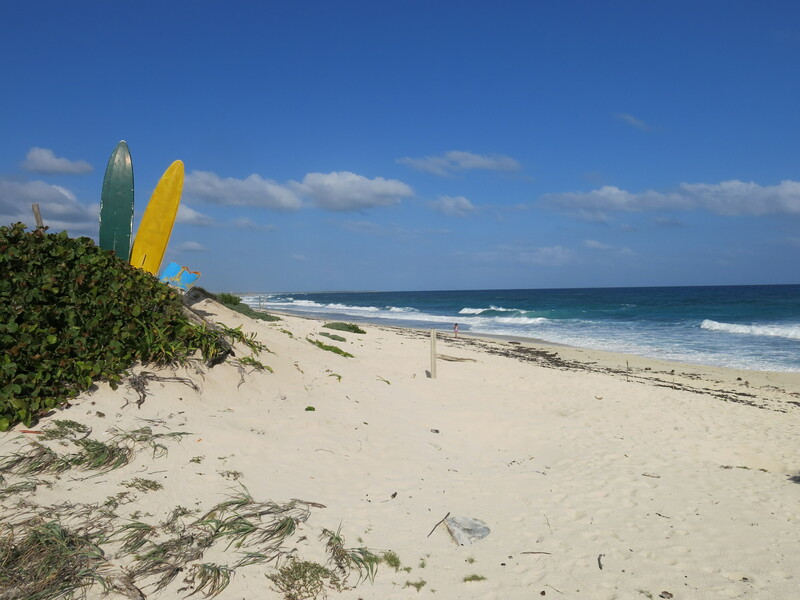 Beaches on west side of Cozumel are vast and unspoiled. We tour the southern part of the island on an excellent highway with wide shoulders and an adjacent bike path, which is paved. It’s an easy trip back to the Hotel Flamingo, a small establishment in San Miguel, which is three streets north of Plaza Benito Juarez, the main square, and just up the street from the sea. There, we sip an excellent margarita, a confection made by the congenial and informative bartender, Oscar, and chat with the ever-changing flow of guests from Canada, the U.S. and Australia. A few days earlier, the hotel had arranged an afternoon of snorkeling in the reef just south of the town. I was happy to look at the wide array of colourful fish while cruising along on the surface of the buoyant water without a flotation vest. And buoyant is how we felt after a week of exploring Cozumel and Coba. We decided on a Yucatan vacation at the last minute during the busy post-Christmas period. With most hotels fully booked in Playa del Carmen and Tulum on the Mayan Riviera we turned to Cozumel and we were not disappointed. We stayed at the small Hotel Flamingo in a large room with a balcony on the narrow street for about $100 a night, including breakfast. It was highly rated on TripAdvisor and deserves the accolades. The staff was gracious and accommodating at all times. The hotel has no pool but there are beach bars within walking distance. There is a dive shop two doors away. One block away is the awesome Zermatt bakery where you can also get a good espresso or cappuccino. There are many restaurants within easy walking distance of the hotel. Some face Plaza Benito Juarez, the main square. We had bracing cappuccinos at Palmeras just opposite the ferry pier (there is a ferry hourly to Playa del Carmen). We also ate dinner at two restaurants on the plaza – Mozaicoz and Dorados de Villa. At the latter, we had a plate of guacamole, chicken quesadilla, filet of fish, two beers and a bottle of water for $28. Several airlines fly directly from Montreal to Cancun, including Air Transat, Sunwing and Air Canada. Prices vary depending on the season. We took the ADO bus from the airport to Playa del Carmen ($9.36). The ferry cost $6.24. The ADO bus to Coba from Playa cost $7.17 and entry to the ruins was $3.59.